Do you have German ancestry or a German name? Chances are, if your German forebears came to New Zealand between 1842 and 1869 they landed in Nelson. The Moutere Inn History Marquee at the Sarau Festival contains a display of early settlement in the Moutere Valley with interesting history panels, loads of folders and local historians on hand to discuss the early English and German settlements in the Moutere. Bring along your questions, photographs, family trees and memorabilia, or just join us for a chat. 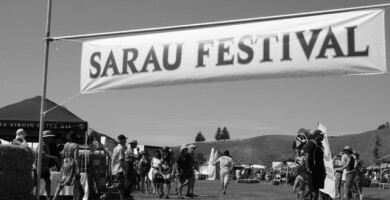 This marquee is always one of the favourites at the Sarau Festival so make sure you allow time to browse, and if you cannot make it to the Festival remember that the historic Moutere Inn has lots of old photos and documents on display. The valley was also developed by early English settlers and an article about the fabulously restored Somerset Cottage can be found here.